These easy Keto Bread Sticks will become a versatile snack at your home! And are the perfect dish to bring to parties. If you’ve missed bread sticks for a while then you’re in luck. These gluten-free bread sticks are wonderfully keto and really easy to make! Keep reading to find out why they are less than 1g net carbs per stick! Keto Bread Sticks – naturally gluten free! Originating from Italy, the bread sticks we’ve come to know and love were generally crisp and pencil-sized. They made for delicious snacks and went with our favourite dips and meals. Regular breadsticks, at 100 grams per serving, amount to 68g total carbs. Luckily for us, we now have a keto bread stick for you to enjoy! 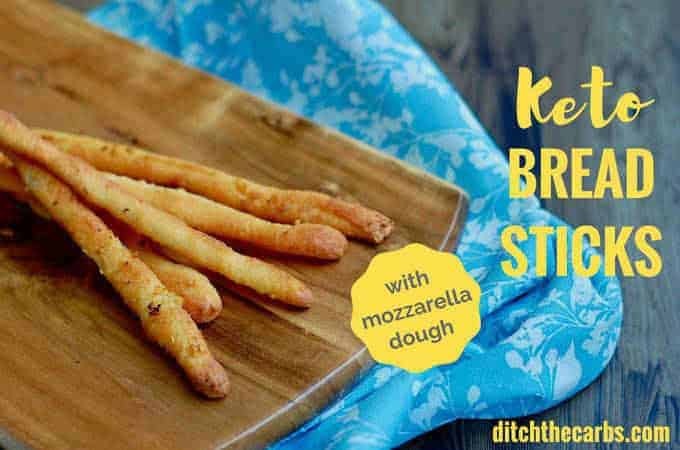 Cheesy Keto Bread Sticks – what is mozzarella dough? For this of you who are new here, you may have stumbled upon mozzarella dough recipe. It is sometimes referred to as Fat Head dough dough. The great thing about this cheesy mozzarella dough, is that there’s absolutely no grain or wheat at all. Yes, it is made with cheeeeeeese. 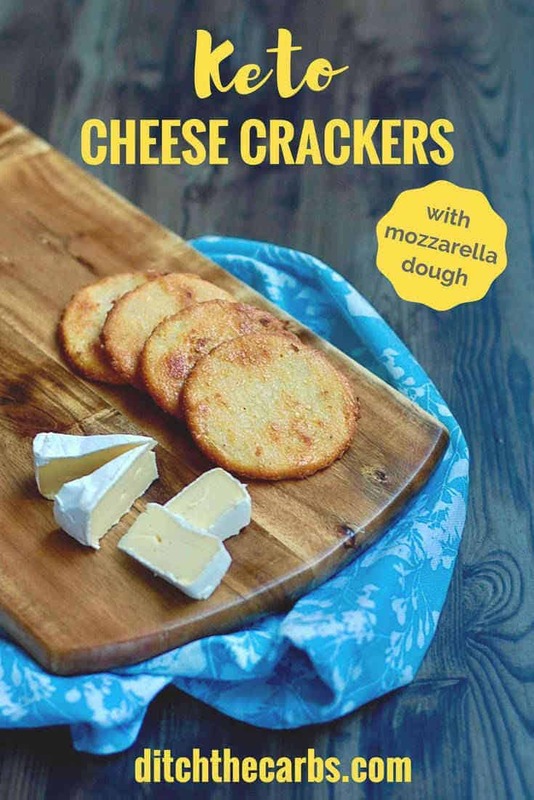 If you have watched my viral video “Mozzarella Cheese Dough – 4 Ways” you will already be hooked on using mozzarella dough in a number of different recipes. Scroll down to watch the quick Mozzarella Dough cooking video. Mozzarella dough has struck again! 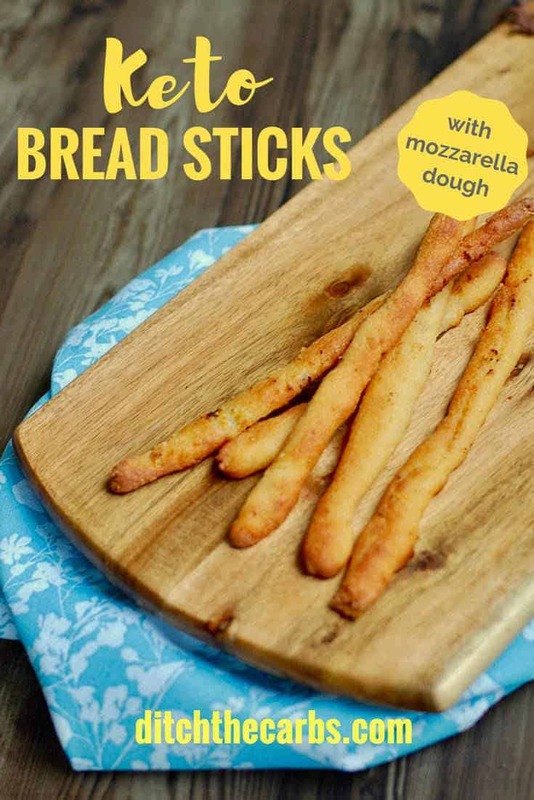 With all of its uses such as cheesy keto garlic bread, Fat Head pizza dough and scrolls, this versatile mozzarella dough can also be used to make your childhood favourite bread sticks. Naturally free of gluten, wheat and grain, this cheesy dough is perfect for many low-carb recipes that require bread. Why not make some for your lunchboxes or your next party? Serve them up with some cream cheese, low-carb soup or zoodles! There are so many possibilities! Give this easy recipe a try! Here’s a quick video so you can see how to make the basic keto dough. INSANE keto bread sticks with mozzarella dough. Healthy, easy grain-free and gluten free recipe. Place the shredded cheese, cream cheese, almond flour (or coconut flour - see notes) and a pinch of salt in a microwaveable bowl. Add any optional flavours. Microwave on HIGH for 1 minute. Stir then microwave on HIGH for a further 30 seconds. Add the egg then mix gently to make a cheesy dough. Take small portions of the mozzarella dough and roll into a long, thin bread sticks. Place on a lined baking tray/sheet pan. Bake at 220C/425F for 10 minutes, or until golden brown. Keep a close eye on them. They may require more or less cooking time depending on how thin or thick you make your bread sticks. Mozzarella dough can also be made by replacing the almond meal/flour with 1/4 cup (4 tbsp) coconut flour. Holy cow! These really are DELICIOUS!!! My dad is on a keto diet so I tried some random recipes for Thanksgiving so he will have something to snack on. I may have to make a second batch. I’m not going to have any left for our celebration if I don’t quit eating them! The dough is super easy to prepare. I rolled each rope a tad wider than a wooden pencil. I took a little too long to roll them so, by the time I got to the end of the batch, they were a little harder to hold together while rolling as the dough had cooled off quite a bit by then. I added garlic powder instead of raw garlic and some dried rosemary and they are fabulous!!! There is a substitution in the recipe notes for using coconut flour, but I’m afraid I have never tried using flax meal. So these are freaking amazing! I made it with the almond flour, will try coconut flour tomorrow to cut the carbs. We literally were fighting over the last few! So so good! Thank you so much for these! They were quite good. 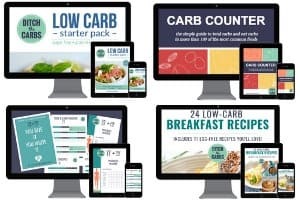 Keto is new to me (2 weeks now) , and as a vegetarian, my meals were getting too rote and boring. Made these today (adding a bit of psyllium husk powder to the dough) and served them with a baked cauliflower dish. Even my non-Keto husband, mother, and kids liked them! Awesome Dana! I also have a recipe category for vegetables you can search here. Some of my vegetable side dishes do contain meat but you can easily adapt many of the recipes to remove the meat aspect. For example, prosciutto wrapped asparagus, just omit the prosciutto and still add the parmesan cheese. Buttery bacon Brussels sprouts, don’t add the bacon bits, and buttery Brussels sprouts are good on their own. I have a recipe coming up soon for mashed cauliflower 4 ways, you’ll love that one too. I’m trying to create more vegetarian recipes as there is such a demand for them. I’m guessing you have to let the dough cool after it is mixed because it is so sticky it impossible to roll into bread sticks? The dough should never bee too hot to handle, never heat the cheese this much. By the time you have mixed all the ingredients together, the mozzarella dough mixture is pretty much at room temperature. I pull small pieces and roll them on baking parchment until they look like thin breadsticks. I also like to sprinkle them with a variety of salt, garlic, bagel seasoning or a few toasted sesame seeds. Hi, do you really get 20 breadsticks from one batch? I have tried and can’t get close to 20. Thank you. When making the recipe for the pizza, how many servings is one pizza? Here is the link to the mozzarella dough pizza page. The pizza recipe makes 6 slices. Can i use almond flour as I do not have almond flour/meal? Yes, almond flour/meal means you can use almond flour or almond meal. They are interchangeable in many recipes. Seems to be yummy! As I don’t have a microwave, can I heat it in a pan? Yes, on a slow, gentle heat and keep an eye on it so it doesn’t stick and burn. Great idea! I will definitely be trying these out to accompany winter soups or boiled eggs! Just one note, I think Method #1 is missing the usual’ microwave for 1 minute’. Whoops! Thank-you for pointing that out. I seem to write and re-wrtie my work all day and so sometimes miss the most obvious things! Why do I need Psyllium husk in the almond flour bread? Do I use the flour, powder, whole? It swells and makes a gel to hold the crumb texture together, almost replacing what gluten would generally do. You may omit it if you like, but the texture may be a little crumblier. I use the powder, but if you use the whole husk, it will work, but just take a little longer to swell and gel. Where does it say in the recipe to add psyllium husk powder? How much? can I use xanthan gum instead? If so, how much? That reader was commenting on the wrong page. She was referring to the almond flour bread. This is the recipe.